Has Hollywood Shot itself in the Head? The Oscars has plummeted in viewership. The Academy of Motion Picture Arts and Sciences’ was criticized last year for failing to nominate any minority actors for the second consecutive year. The whole thing has become political and Hollywood has assumed its importance is far more than what its industry simply was – entertainment. This year, epic mistake before almost 33 million viewers live was the announcement of “La La Land” as Best Picture of the year. 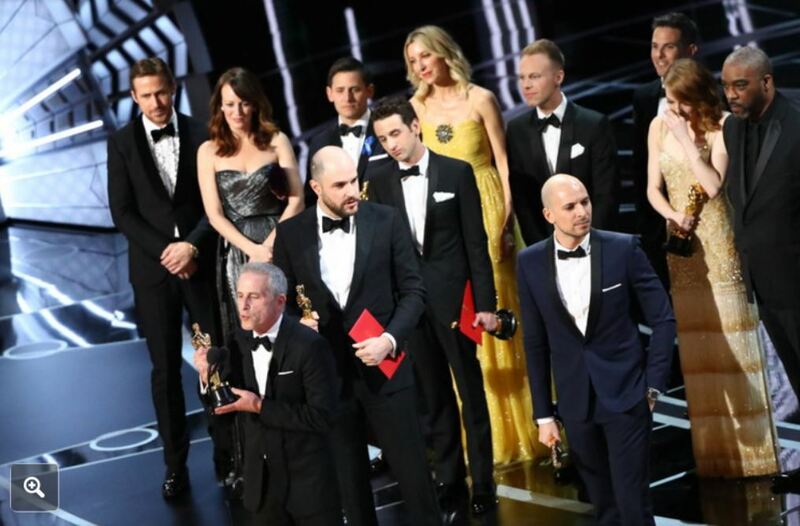 It took a few minutes to realize there was a mistake, but only after the actors for La La Land were on stage and giving acceptance speeches. The Academy had selected instead “Moonlight,” an all-black, gay-themed film some say because it was criticized for no minority actors being granted awards for two years. Of course, neither film was in the top box office expectations for 2017. The Domestic Total as of Feb. 28, 2017 for La La Land has been $141,935,532 since its release date of December 9th, 2016 whereas Moonlight Domestic Total as of Feb. 28, 2017 was $22,563,405 from its release date of October 21st, 2016. Obviously, the people who watch films do not count and this is making the Oscars appear to be an aggrandized self-congratulating secret political club who then think’s its opinion in presidential politics counts. The 89th Academy Awards, however, reached nearly a new low in viewership. 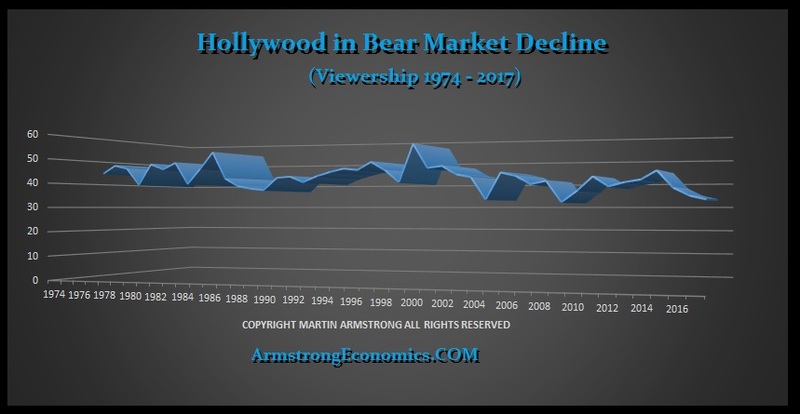 The industry that sees itself as being more of a politically correct role rather than entertainment elevating its position within society beyond arrogant, is in a serious bear market along with Football. The 89th Annual Academy Awards brought in an average of 32.9 million viewers, according to ABC. That number is the second lowest viewership in Oscar history and is down from the 2016 broadcast of 34 million. Indeed, 2017 was the lowest rated Oscars since 2008 where Jon Stewart hosted and “No Country For Old Men” won Best Picture. That broadcast brought in 32 million, according to Nielsen. The two peaks were 1983 coming in at 53 million and 1998 at 55 million. Clearly, our model is warning that a break of the 2008 low points to a significant decline into 2024. Hollywood just may have shot-itself in the head with all this political posturing.